Illustrations © The Estate of John David Roberts. Reproduced with the permission of the William Roberts Society. 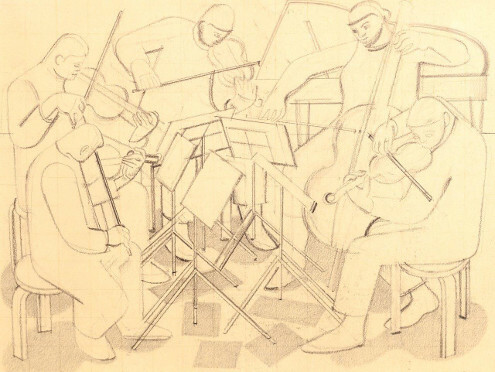  The Return of Ulysses 1913 and Professor Janko Lavrin 1919 are on show at the Castle Museum, Nottingham. 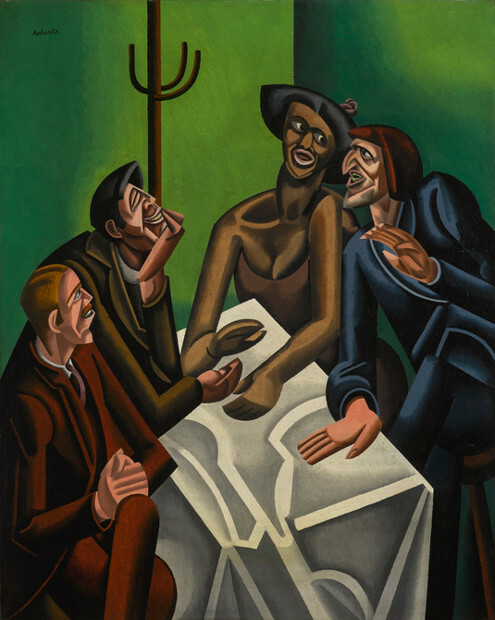  The Diners 1919 is on show as part of the 'Media Networks: Modern Times' display at Tate Modern (level 4). 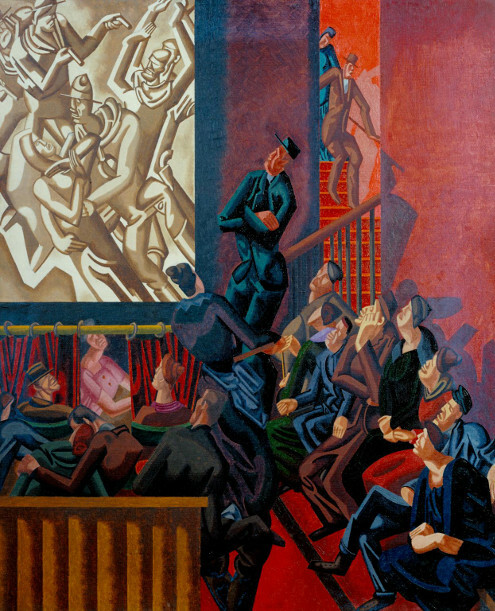  The Cinema 1920 is on show in the 'Walk through British Art' display at Tate Britain. 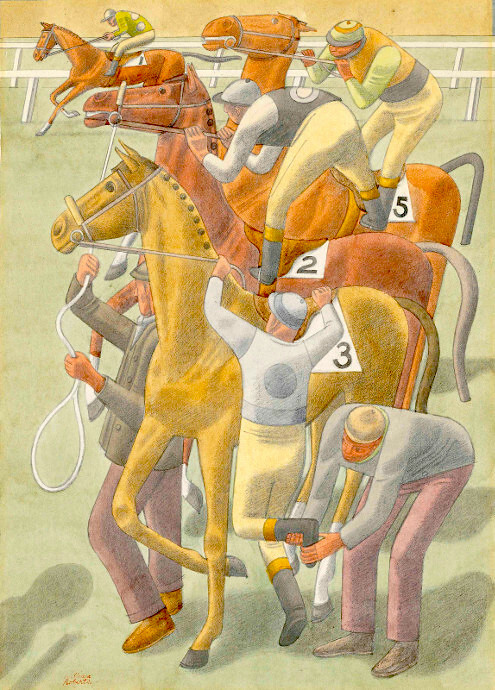  At the Hippodrome 1920 is on show at the MK Gallery, Milton Keynes, as part of the exhibition 'The Lie of the Land' until 26 May.  The Crucifixion c.1922 will be on show at Bishop Street Methodist Church, Leicester, as part of an exhibition of works from the Methodist Modern Art Collection entitled 'Wondering Soul' at five venues in the city from 2 May to 9 June. 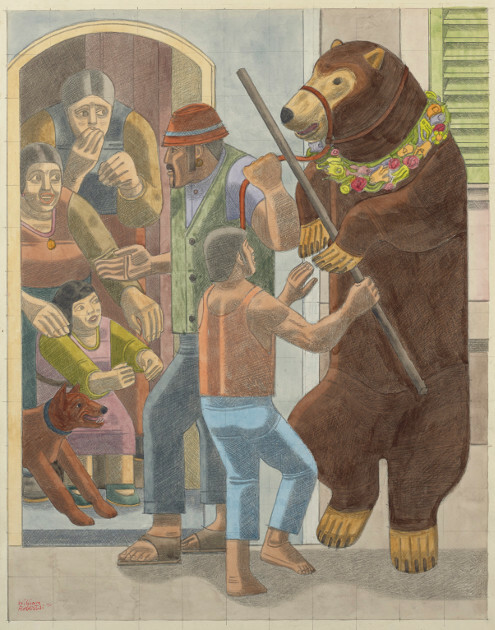  The Happy Family 1924 is on show at the Russell-Cotes Art Gallery and Museum, Bournemouth.  Christ Driving the Money Changers from the Temple 1925 is on display at the Ferens Art Gallery, Hull. 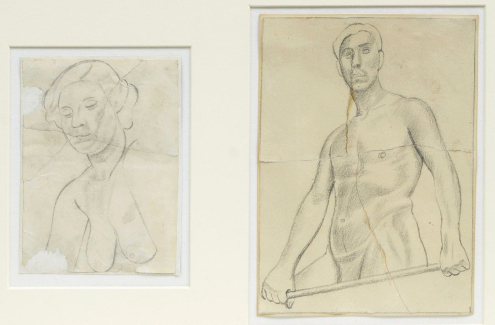  The Garden of Eden c.1926, Artist and Wife 1940 and The Swimming Bath c.1959 are on show as part of the exhibition 'Counterpoint: Stanley Spencer and his Contemporaries' at the Stanley Spencer Gallery, Cookham, until 3 November. 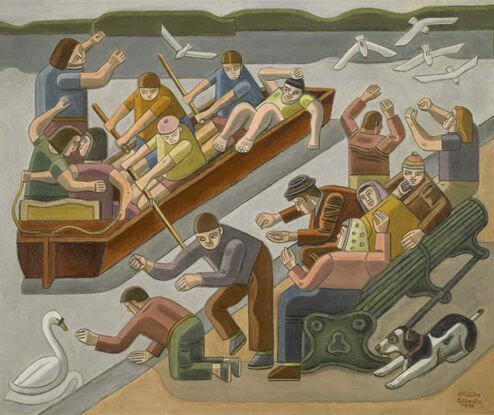  Bath-night 1929 and Some Recipes 19425 are on show at Bolton Museum and Art Gallery in a display looking at depictions of working-class culture. 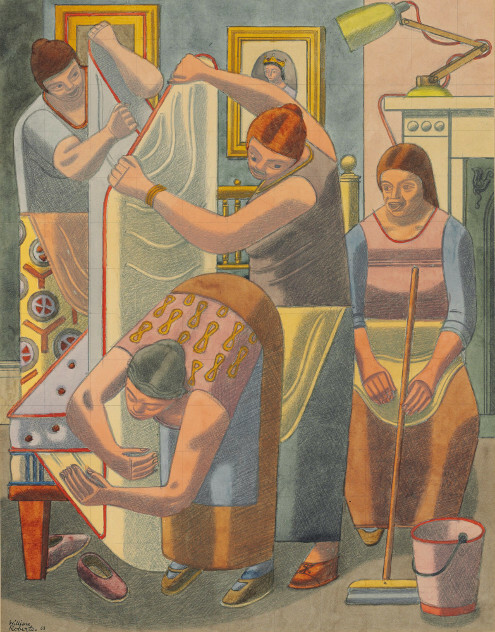  Dressmakers c.1931 is on show at the Victoria Art Gallery, Bath. 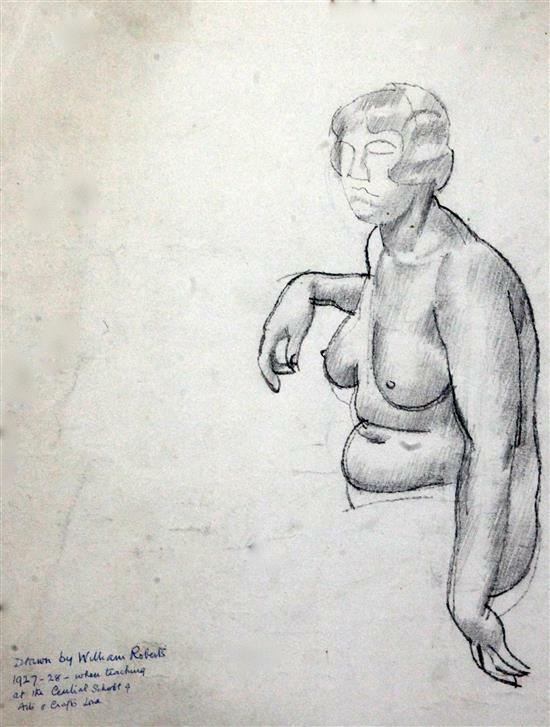  John Maynard Keynes and Lydia Lopokova 1932 is on show at the National Portrait Gallery, London. 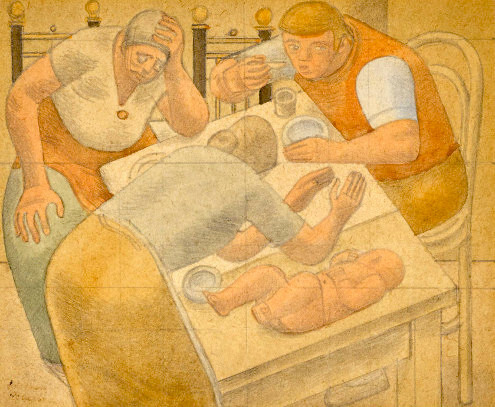  The Family 1934 is on display at Leeds City Art Gallery.  The Palm Foretells 1937 will be part of the exhibition 'Magic' at Bristol Museum and Art Gallery from 19 October. 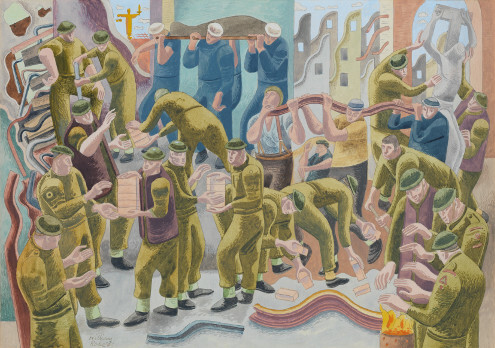  The News 1941 will be part of the exhibition 'War and Rumours of War: 1940s British Works on Paper from The Hepworth Wakefield', at the Victoria Art Gallery, Bath, from 6 July to 15 September. 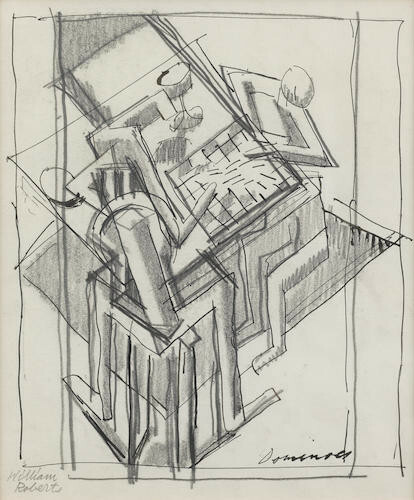  La Nature Morte 1948 is on show as part of the exhibition 'Artist and Model: Portraits, Self-Portraits and Figure Studies from the Swindon Collection' at Swindon Museum and Art Gallery until 20 July.  The Goats 1952 is on show at the Hatton Gallery, Newcastle, as part of the display 'A Philosophy for Teaching Art: The Development of the Hatton Collection' until 18 May. 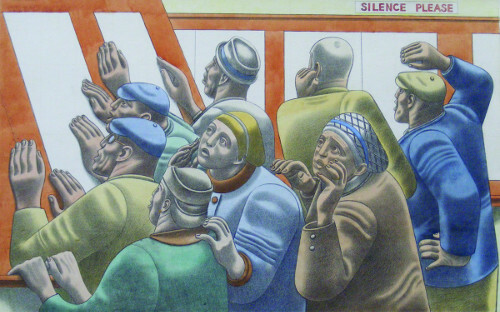  The Revolt in the Desert 1952 is on show at Southampton City Art Gallery until at least the end of 2019.  The Common Market 1963 is on show at the Harris Museum and Art Gallery in Preston.  The Aeroplane Scout 1919 is on show until 2 June as part of the exhibition 'A Certain Visual Argot: British Modernism from the Early to Mid-Twentieth Century' at Dunedin Public Art Gallery, New Zealand. 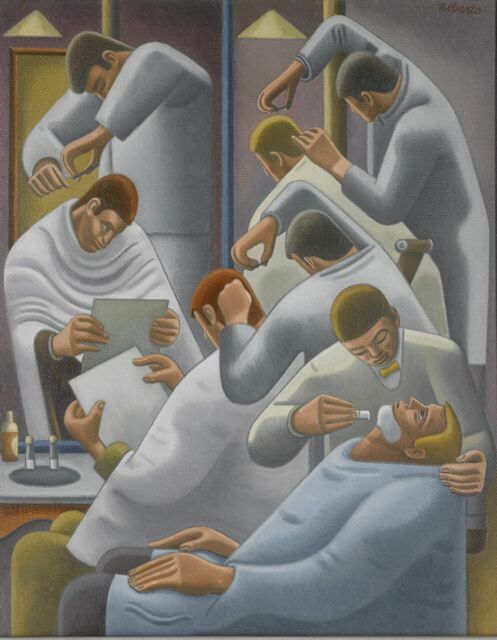  The Interval before Round Ten 191920 is on display at the Art Gallery of New South Wales until May.  The Red Turban 1921, from the collection of Graves Art Gallery, Sheffield, will be on loan to Museum MORE in Gorssel, The Netherlands, for the exhibition 'British Realist Painting' from 14 September 2019 to 5 January 2020. The information above is believed to be accurate, but it would probably be worth checking with the galleries before making a special trip to any of them. 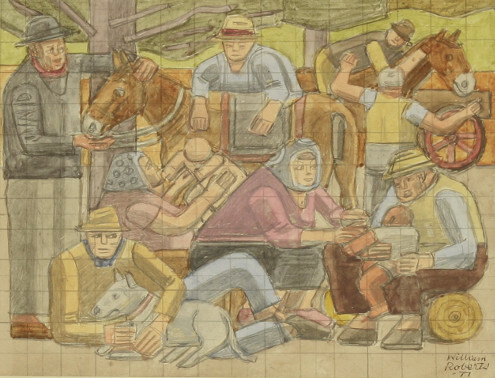 Please click here for a list of other works by Roberts in public collections, which can usually be viewed by appointment.